St. Louis is famous for the Italian food served at restaurants in the small southside neighborhood known as The Hill. The reputation of The Hill has grown to the point that "Saveur," one of the nation's leading gourmet food magazines, recently dubbed it "America's Other 'Little Italy'" in a cover story. Now your customers can take home the delicious authentic Italian flavors of The Hill. With Taste of The Hill products, you can carry a full line of of sauces and dressings based on the recipes that have helped make The Hill synonymous with great Italian food. Taste of The Hill is the signature product line of River Town Foods Corporation, one of St. Louis' leading food manufacturers. 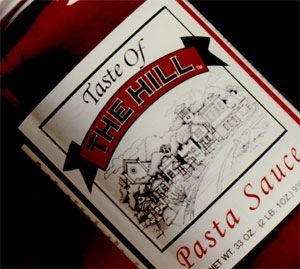 River Town introduced the brand to St. Louis retailers with Taste of The Hill original flavor pasta sauce in 1996. Within three months it became the leading local brand on the market, a position Taste of The Hill continues to hold today. Other Taste of The Hill products soon followed with similar success. Taste of The Hill Mushroom and Onion pasta sauce, Taste of The Hill Four Cheese pasta sauce, Alfredo and Tomato Alfredo sauces, Pizza sauce, Sweet Italian and Parmesan Ranch dressings. Each of these products are available to retailers-and the institutional food service distributors-nationwide and can be found in markets throughtout the Midwest. The famous reputation of The Hill and its nationally known restaurants will help give Taste of The Hill name recognition with your customers. And each product is priced competitively with other major brands so you can enjoy strong sales and healthy profit margins. To learn more about the complete line of Taste of The Hill products and how to order them for your store, please contact River Town Foods at 1-800-844-3210 (in St. Louis, call 314-776-5646).